I'm a little late, because I'm still catching up with a large commission. Still, I had time to make this ring which matches the Woven cuff. I'm planning to give it as a bday gift to the owner of this very cuff... 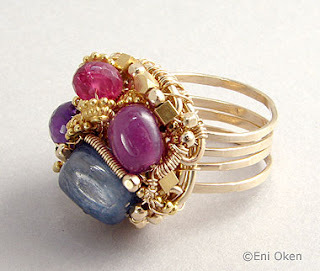 The ring was made with goldfilled wire, kyanite, amethyst, pink tourmaline and magenta opaque ruby.